I write at several different cafes in my area, most of them Starbucks. I have a favorite table at one of them, right next to a large window and the parking lot. Lately I've been writing my upcoming novel "Drone Fever" and a short story called "Daybreak" while there. I'm often there in the mornings. But I had gone elsewhere one day. So when I returned the day after, I was surprised to see a large piece of cardboard where a window had been. I assumed as anyone would that someone had thrown a rock through it overnight. I didn't even mention it when I approached the counter for my coffee. The barista waiting for me told me how lucky I was that I didn't come in the day before as usual. Because a car had driven right through the parking lot, onto the sidewalk, and smashed through their front window! On the other side of that window was the table where I always sat. She said the car hit the table and it landed on the other side of the wall. I would have been killed if I had been sitting there! As you can see from the picture, the window has yet to be replaced. Ever since the barista told me about it, I've wondered what would have really happened if I had been sitting there. Would I have noticed the car approaching and jumped out of the way in the nick of time? Would I have suffered a broken arm but still managed to survive? I suppose in another universe, I was sitting there when the car smashed through. But in this universe, I was somewhere else. If I were a little more paranoid, I would suspect someone had put out a contract on me and the driver had been paid off to do the job. But who and why? I've been waiting for weeks for them to replace that window. Why? For one thing, I don't worry about another car smashing through the window, contract on me or not. But there's more. After they had inserted the cardboard into the empty window, I returned and sat at that table again. After some time, I smelled something funny, and then the odor became overpowering. It was the strong smell of cigarettes! I looked around to see who was smoking a cigarette inside a Starbucks cafe, as I had never seen anyone do it before. But I saw no one smoking. Then I looked around past the cardboard to the sidewalk outside. Right in front of the cardboard stood a man smoking a cigarette. The smoke was entering the cafe from around the sides and the bottom. On top of that, he would drop his still-lit cigarette on the ground right next to the bottom of the cardboard and then come back into Starbucks and sit there for a while at his laptop. Then after a few minutes, he would go outside again and continue smoking that lit cigarette he had left beneath the cardboard. So the effect of not having a window was that the cafe around my table was filled with strong cigarette smoke coming from outside. I've decided not to go there until the window is fixed or I don't see the smoker around. It's been weeks since the window was busted, yet it still hasn't been replaced. 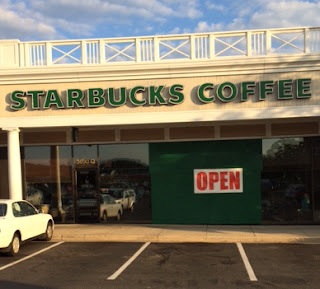 The barista said they would fix it a couple weeks ago, but still no window. Having narrowly escaped death at Starbucks, it reminds me of the story I wrote here earlier called "Unearthly Entities Haunt Starbucks." Some sort of other-worldliness is around these cafes, but it doesn't seem to affect or threaten anyone but me.